I’m just back from Salt Lake Institute of Genealogy, my second year of attendance at the week-long institute, and my second trip to the Family History Library. On both trips, I squeezed in every available moment among the vast book and microfilm holdings – charging purposefully up and down the stairs (although I did have trouble remembering whether I was up or down.) The ability to research family lines from all over the country using original records (mostly still on microfilm – and lots of it) and an incredibly wide array of published materials makes even a veteran positively giddy. I can’t say enough about the generous resources, both the materials and the expert staff standing by to help at every turn. And I haven’t even been to the international floors! I got off to a slow start. I came in with expectations this time – for heaven’s sake, I even had “research plans.” I must have picked a lot of low-hanging fruit last year. And I agonized over logistical strategies. Index cards or spreadsheets? Electronic note taking or handwritten research logs? Grab-and- go or sit-and-study? Full citations along the way or just enough to help me later? I tossed and turned the week before I left. I mentioned plans (as in the best laid.) That’s when you identify a specific question, carefully analyze what’s already known, identify the records most likely to answer your question, list them (along with physical location and catalog information) in the order in which you plan to consult them, but organized by library area so you don’t mill about. And then sometime before you get to the end of the document, you find the answer. Research Question 2: Who is the father of Carrie Fowler? We are fairly certain she is the cousin of direct ancestor Emma Jane Fowler; here they are pictured together in the 1870s, Carrie on the left, Emma on the right (2). They stayed close throughout life. This time Emma Jane is on the left and Carrie is on the right. Anyway, I’ll have to get back to you later on Obed and Carrie. As one esteemed professional genealogist told me in the break room, “Everything takes longer than you think it will.” (3) It’s not that I didn’t find anything at the library; my next post will detail more general “areas of gain.” And, of course, every record you check without finding anything can be crossed off the list. That’s satisfying, too. The most apt analogy so far — last year, I fell in love, and this year was like a really good second date. I believe my relationship with the Family History Library will be a long and fulfilling one, but my feet are more firmly planted on the ground. 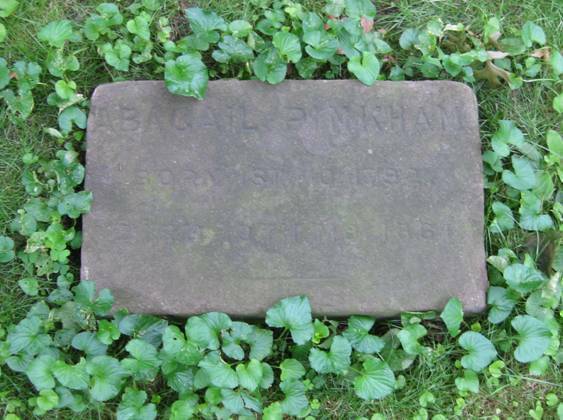 (1) Photograph and transcription of Abagail Pinkham’s marker by Wallace G. Lane, Jr. Flushing Meeting House Graveyard, 136-17 Northern Boulevard, Flushing, New York, 11354. (2) Carrie Fowler and Emma Jane Fowler, circa 1870s. Original photograph from the personal papers of Louise Mitchell Odell, passed from her mother Josephine Pinkham Mitchell, now in possession of Malissa Ruffner, January 2011. Contrast in photograph was digitally enhanced by Wallace G. Lane, Jr.
(3) Elissa Scalise Powell, 13 January 2011.